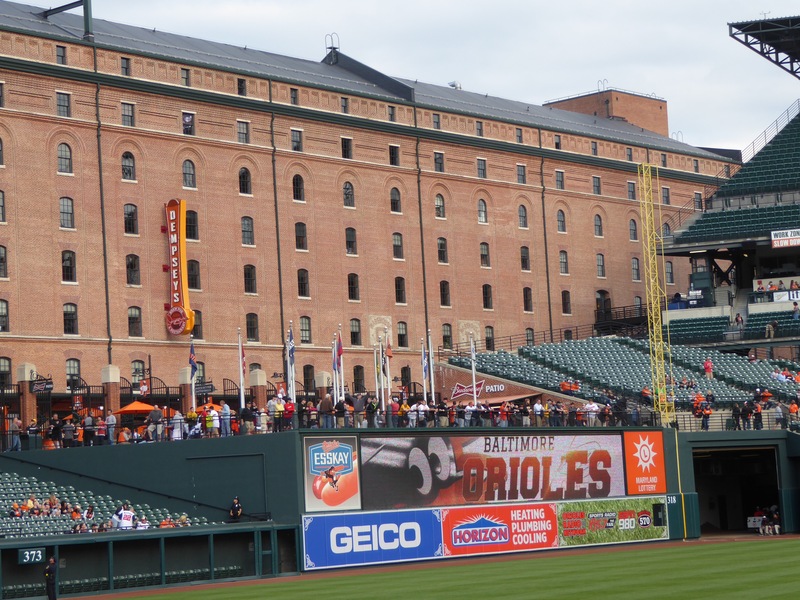 At long last, a visit to the iconic Camden Yards. 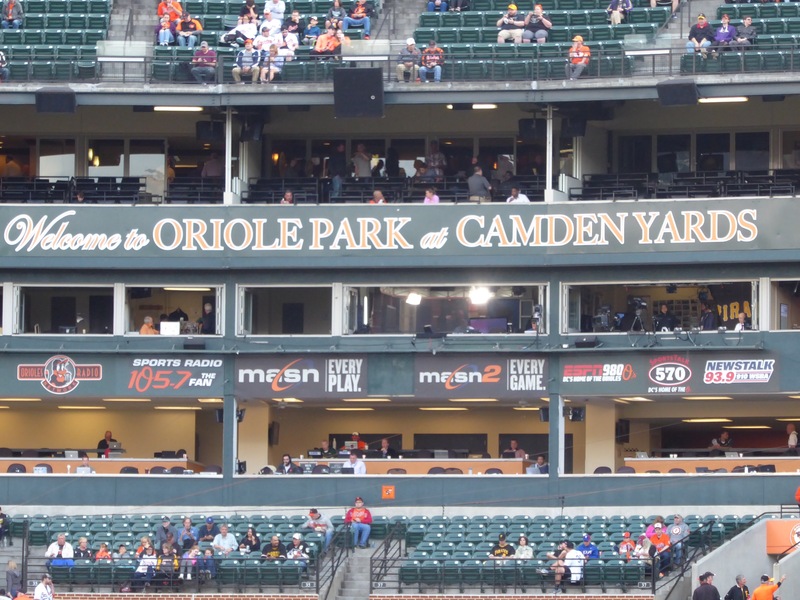 Actually, its title is “Oriole Park at Camden Yards,” but until I got there, I’d never heard the “Oriole Park” part of it. Camden Yards is the first of the new “old” stadiums, opened in the ’90’s, and it is a lovely park. The main entrance opens on an esplanade in front of the Warehouse, which is the view from home plate and which no batter has ever hit on the fly (except Junior Griffey in an All Star exhibition). Because this is Maryland, and because the food most closely associated with Maryland is soft-shelled crab, I felt obliged to try their local specialty. My crab salad roll had plenty of crab, not a lot of flavor, a price tag double that of a premium hot dog, and I couldn’t help feeling that this somehow violated the unwritten rules of baseball. It didn’t help that I could hear a juicy sausage calling my name. On my trip last year, I always sat close in, or at least not in the outfield (inside the lines). 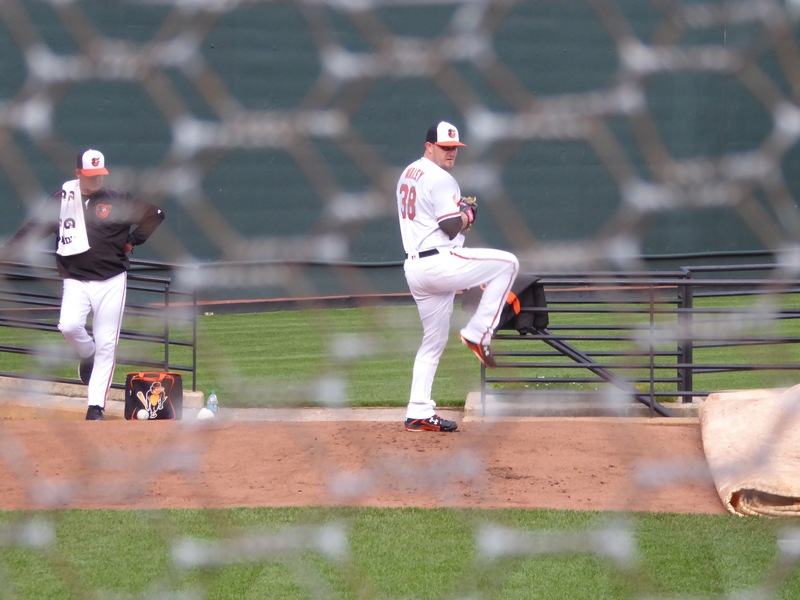 For this game, I decided to opt for a close-up view of two of the premier outfielders in the game, the O’s Adam Jones and the Pirates’ Andrew McCutchen, so I got a seat in the third row in left center, right next to the bullpen. It was a great spot for watching those outfielders, but not so good for watching the game – it was so low to the field that there was no sense of the spatial aspect of the diamond, and as dusk descended, I found it harder to pick up the ball coming off the bat. That gave me an enhanced appreciation for the skill of the outfielders. 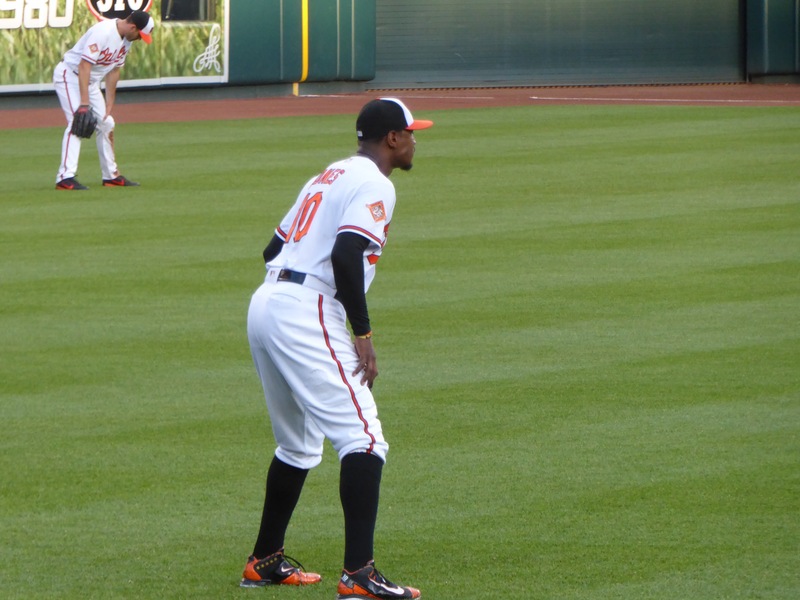 Speaking of them, you will notice that Jones wears his pants at knee length (though without stirrups) and McCutchen in the current all-the-way-down style. McCutchen isn’t as readily recognizable now without his dreadlocks, but, unlike Samson, his loss of hair has not sapped his strength. In the sixth inning, he hit a long one that looked like a goner only to have his counterpart Jones track it down at the wall for the the third out. 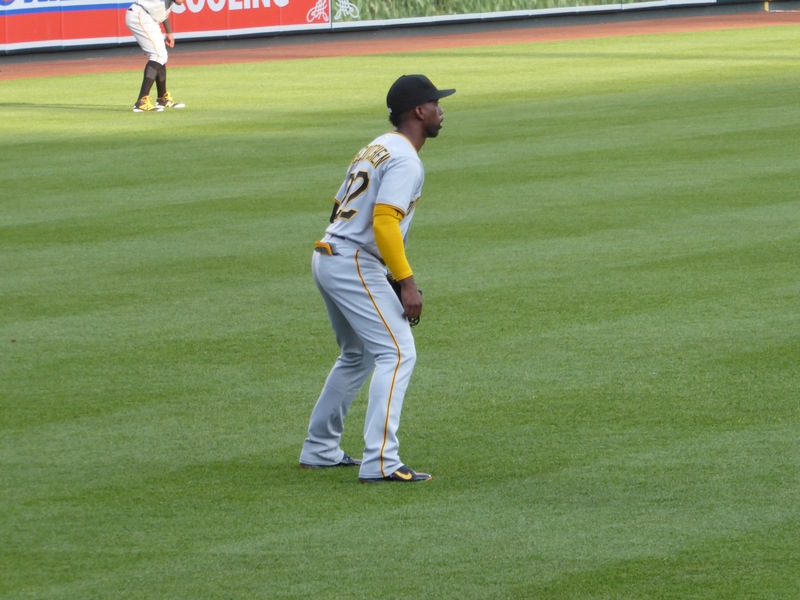 Earlier, as a base runner on third, McCutchen had to hit the deck to avoid a foul ball and stayed there momentarily to rip off a few push-ups, much to the delight of the crowd. The game was a snoozer, thanks in no small part to the play of two former Mariners, Wade Miley and Seth Smith. Miley started the game, but couldn’t get through the third inning, looking as though he was throwing BP for the Pirates. Smith struck out twice in an O-fer that contributed nothing to the effort. My red eye from Portland the night before caught up with me and I thought it would be embarrassing to be found sound asleep in the stands long after the game ended, so I left a little early with the Pirates up 6-1. Bad move. O’s pinch hitter Trey Mancini came in to launch not one but two dingers, the first to put the O’s back in the game and the last a walk-off to win it 9-6. Oh well. . .